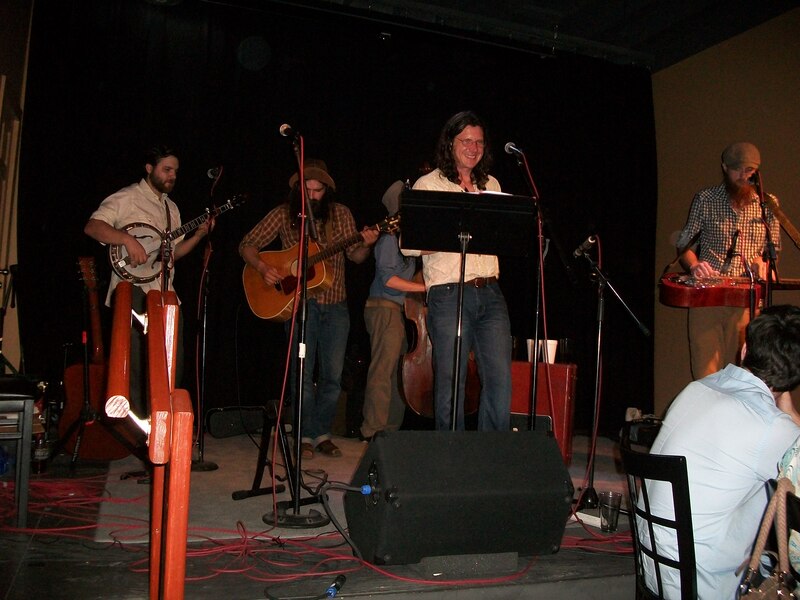 I have not blogged since the time of the Colorado floods. It has been a year of putting our lives back together. Maybe I will tell that story someday, but I want to get back to fiber. Spinzilla, a world wide competition to see what team can spin the most yarn in one week took place October 6-12 (during spinning and weaving week). The results of that competition are not out yet but team Schacht is not even close to winning. There are teams like the Bolivian team who spin for a living (and can’t understand why we would want to spin for “fun” like this for whole week). We are all pulling for this team to win. The tallies are in for our team and I got the most amount of yarn spun on our team. This is what I spun in one week. Not bad considering I work a full time job! I used all four of my spinning wheels (with Sanskrit names): Sidekick (Tantu– meaning thread), Ladybug (Aja– meaning momentum), Matchless (Atula– meaning matchless) and Schacht-Reeves (Suria– meaning Sun). The Schacht-Reeves Suria is the wheel my parents got for me after they saw the look on my face when they presented me with an I PAD for Christmas one year. I am much happier with the spinning wheel as this one goes FAST and really helped me win this competition. You know you are a fiber addict when you prefer a gift of a spinning wheel to an I PAD. I won an Ultra Swift with counter for being the experienced spinner that spun the most yardage on our team. It is one of Schacht’s deluxe tools that is like none other on the market! It is one of the few Schacht tools that I didn’t already have at home. Click here to see what the team spun. We are very happy as we more than doubled our yardage from last year- 61,671 yards this year!!! 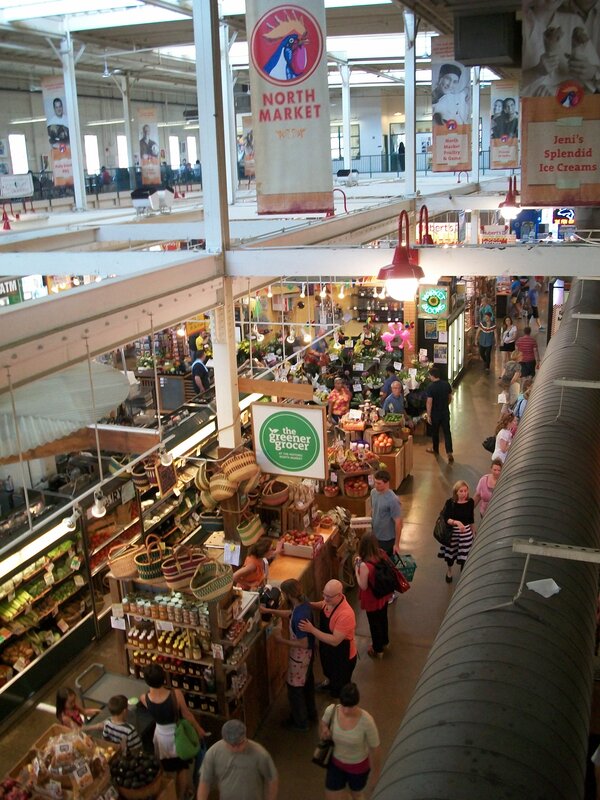 For the Schacht team, it is a team building event more than a competition. A chance for the factory workers to learn a new skill, for those in the office to teach a new skill, and time spent together practicing and enjoying the art of spinning. Even Barry Schacht spins with us. We went to Barry and Jane’s house on Friday evening for chilli and spinning. This week really brings us together! TNNA has bee held in columbus for quite a few years. columbus ohio is actually a pretty cool place. 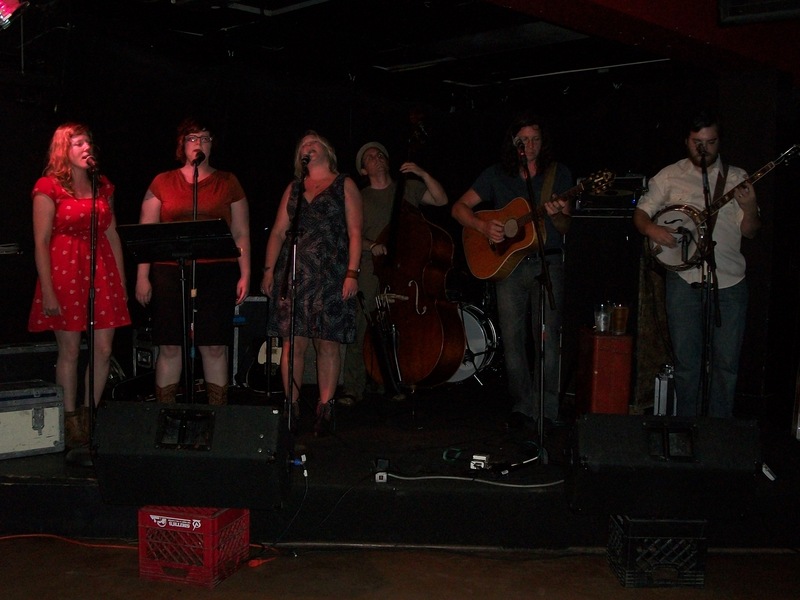 i think the thing i liked about it the most was the diversity and the funkiness of downtown. 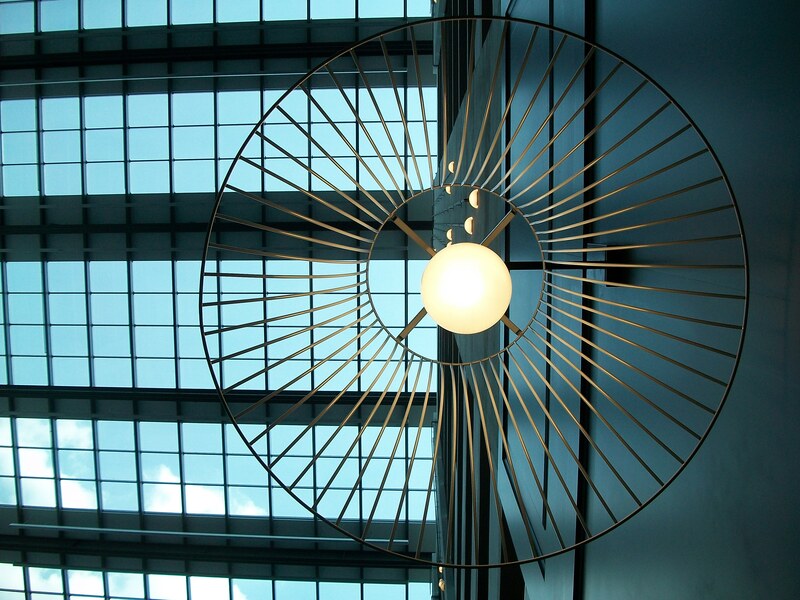 it made for some interesting photos, some at the hotel, and some around down town. i had the privileged of seeing my friend jesse henry. he is an amazing musician. while i was there i caught two of his local shows with two different bands. he is the one smiling in the middle. he was playing with field dogs this night. on the last night i was there, he played with the kits and the hits and they rocked it! the whole trip was a lot of fun! i didn’t get to take many pictures because we were SO busy, but i got a few of projects that either i worked on, or other staff members produced. 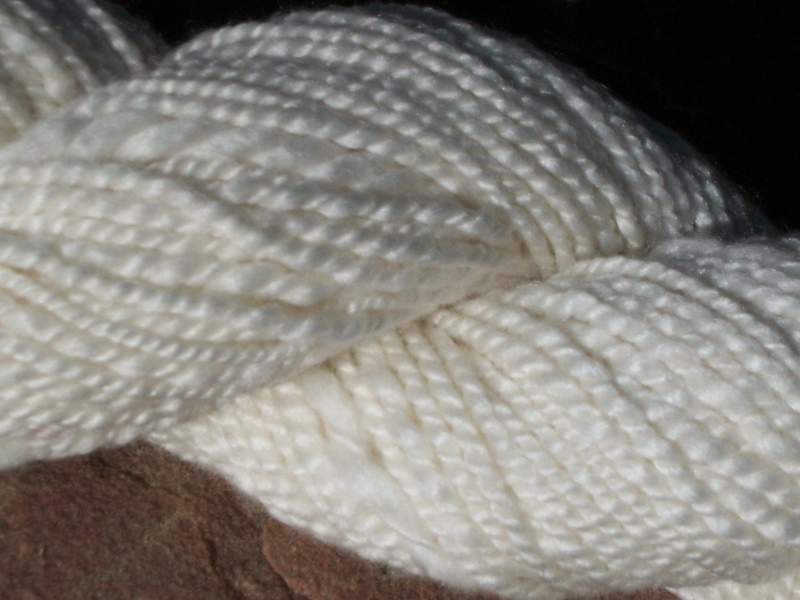 i spun some sample yarn for Louet, they always have great fibers. on the right i did a sport weight 2 ply with their merino that has been attenuated so it spins and feels like silk. 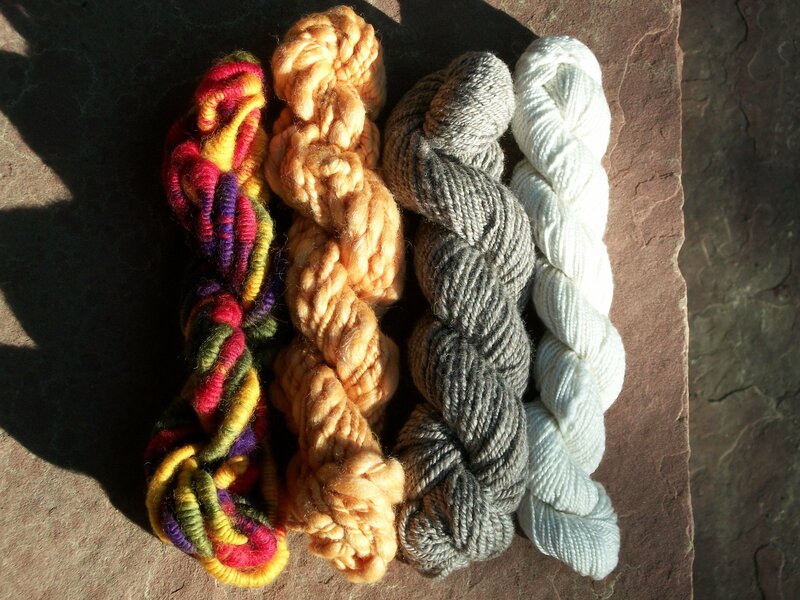 the second from the right is a blue faced leicester top i spun in a 3 ply. 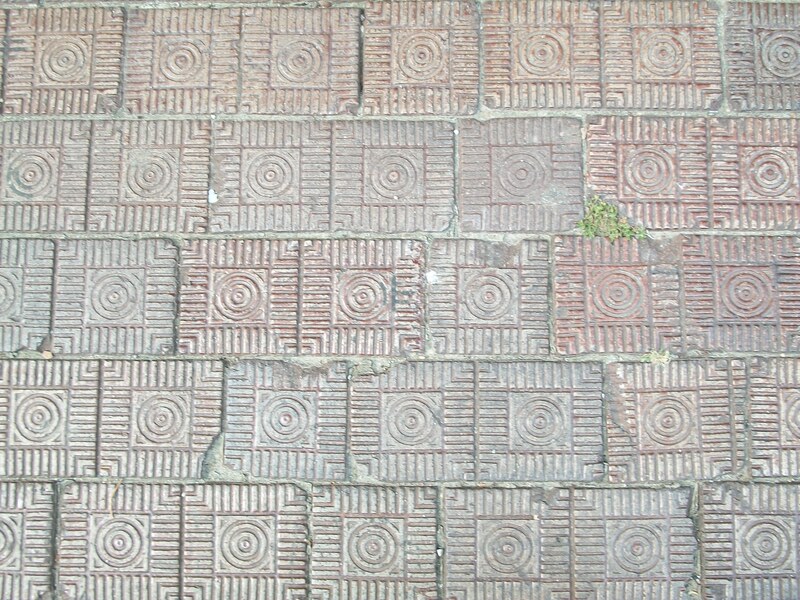 it is naturally colored. the third one over from the right is merino silk thick and thin plied with a sport weight of the same roving. the one furthest to the left is a coil spun yarn with northern lights in the rainbow colorway. i LOVE Louet fiber. they have such a wide variety of fibers to fit any project. 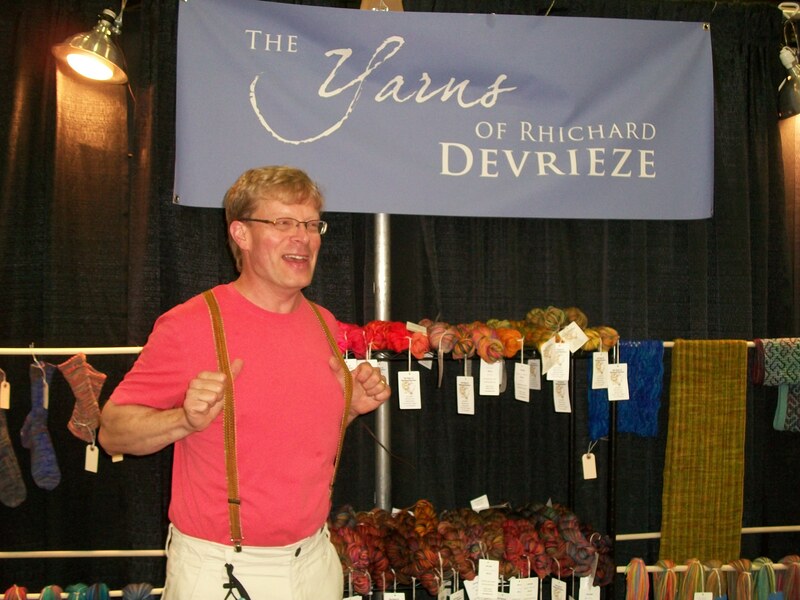 benji, our shipper at Schacht wove suspenders on the inkle loom for Rhichard Devrieze he was SO proud and it was TOO cute! it might be hard to see the rich detail on this shrug. 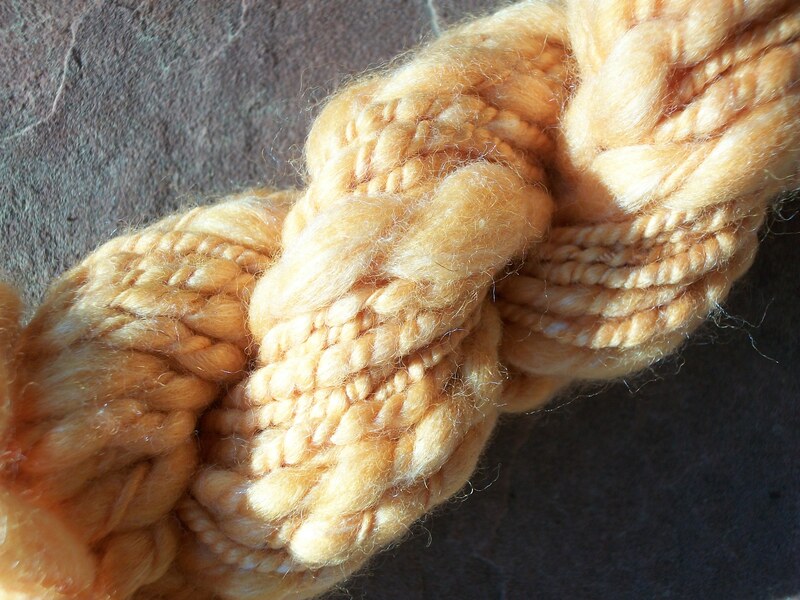 it is hand spun premium alpaca from Natural Fiber Producers roving. 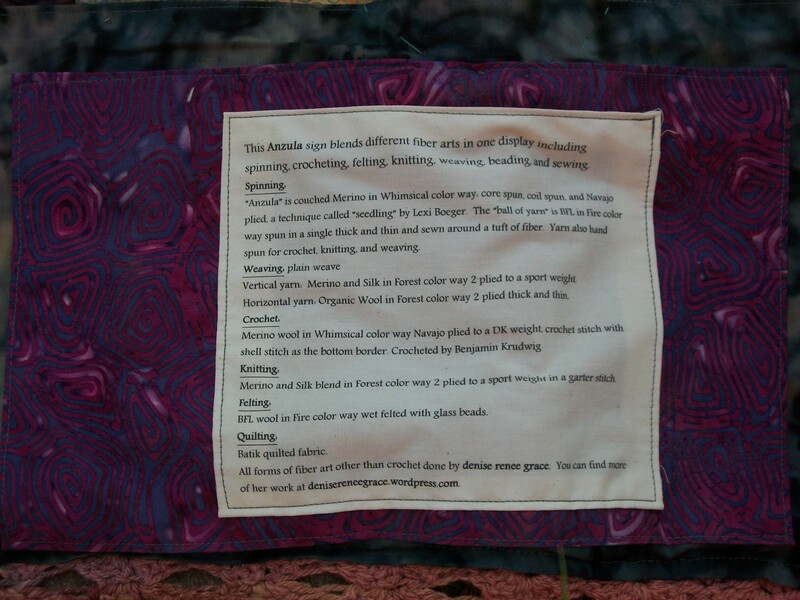 the body of it is spun in a sport weight (maybe a little thinner) and is just plain weave. the collar is a thick and thin with the same roving, but it was crocheted by benji. it looks better on a human, but there are professional photos being taken, so i will post them when they are done! 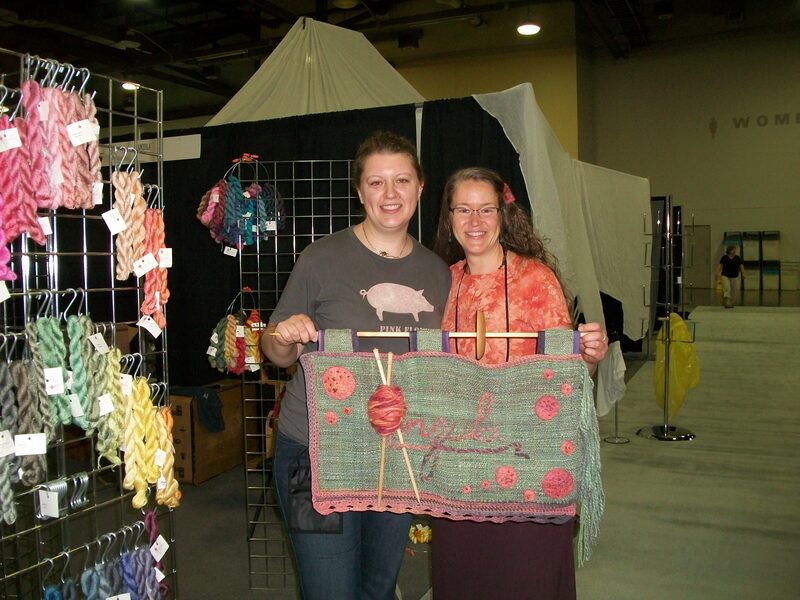 another awesome thing about this TNNA was the Zoom Loom project that i managed. 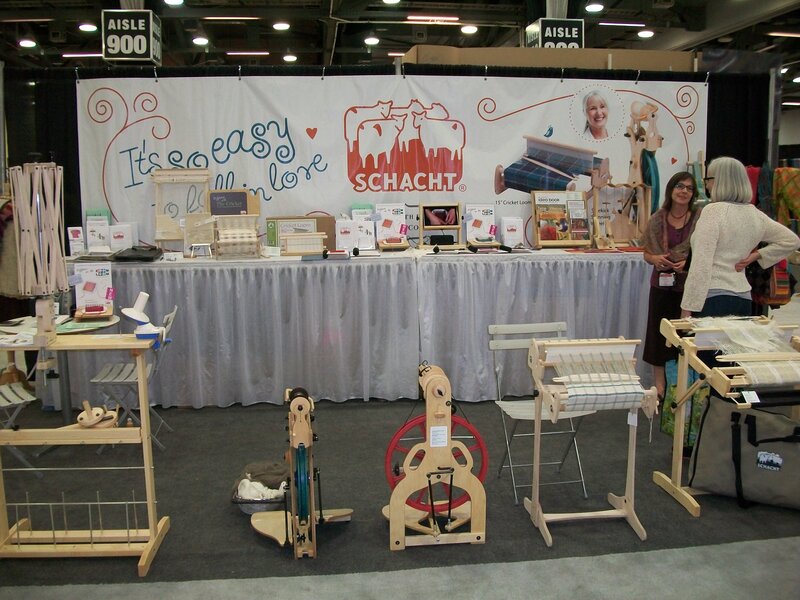 we had about 55 yarn companies send schacht yarn (it was like christmas every day for a few weeks as the yarn came in the mail), and we made displays for them. when we were setting up for the show, we delivered them to people’s booth. so we had 55 Zoom Looms all over the show featuring each companies yarn. here is the display for Universal Yarn. it turned out great and looked fantastic beside the knitted sample of the same yarn. all in all, TNNA was a success. 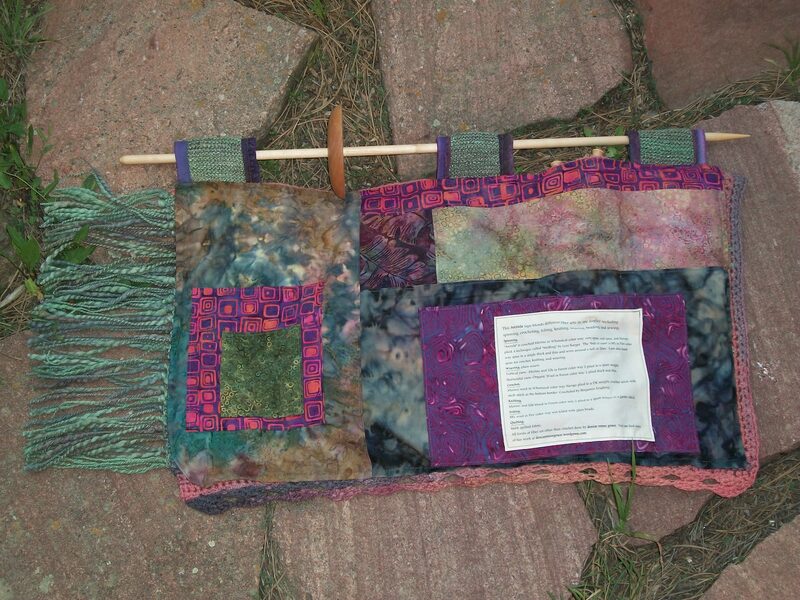 i am looking forward to starting soon on projects for the next TNNA. i am not usually into super bright colors, but i fell in love with these yarns when i first laid eyes on them. 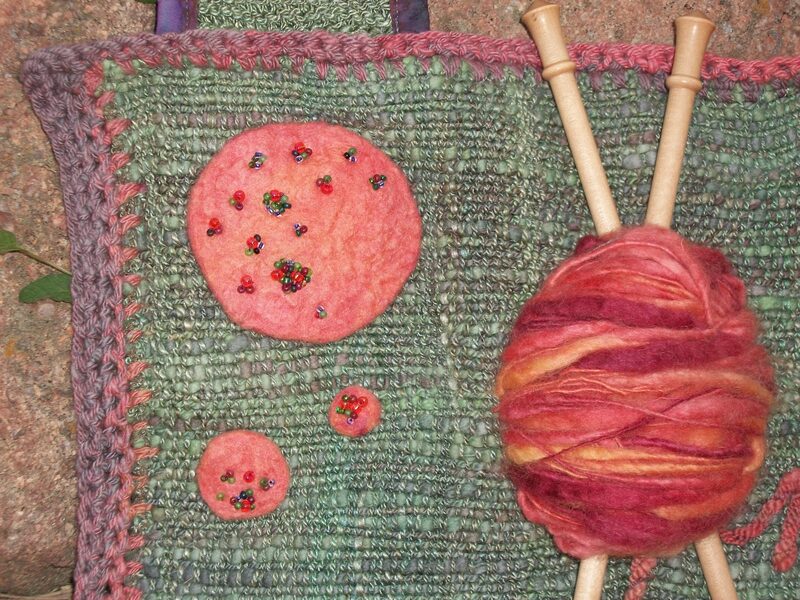 pixie dust in azalea bloom and maharani silk in firework from Knit Collage. 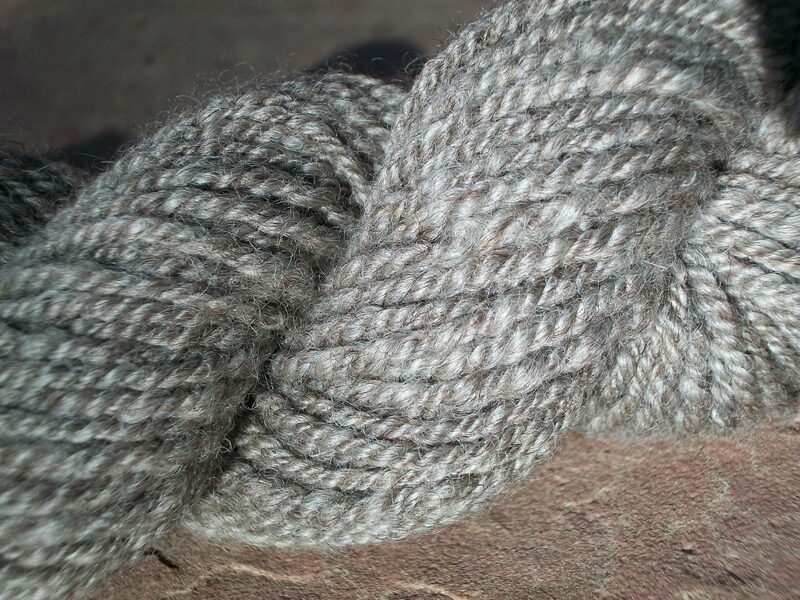 these are amazing handspun yarns. the weft (horizontal thread) is core spun thick and thin. for those of you that don’t understand that it basically equals A LOT of work! 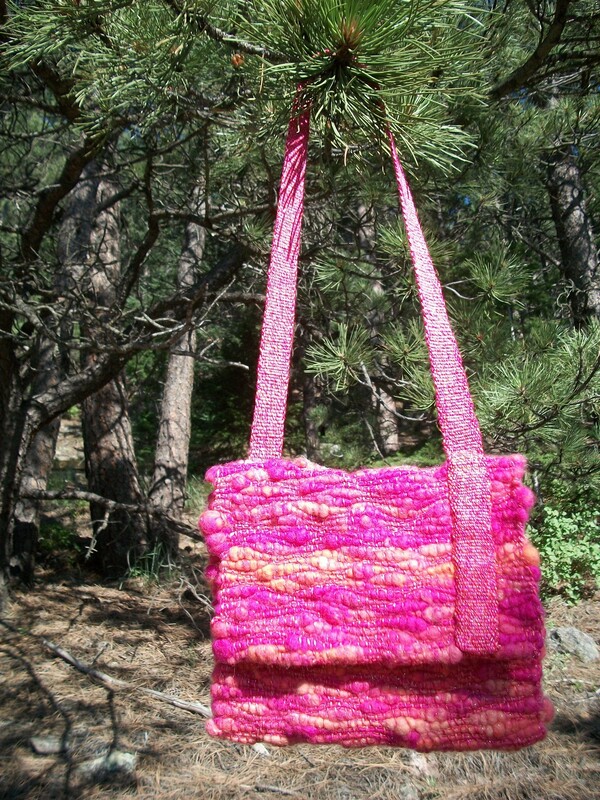 i knew i wanted to weave a bag that would show off the texture of the yarn. 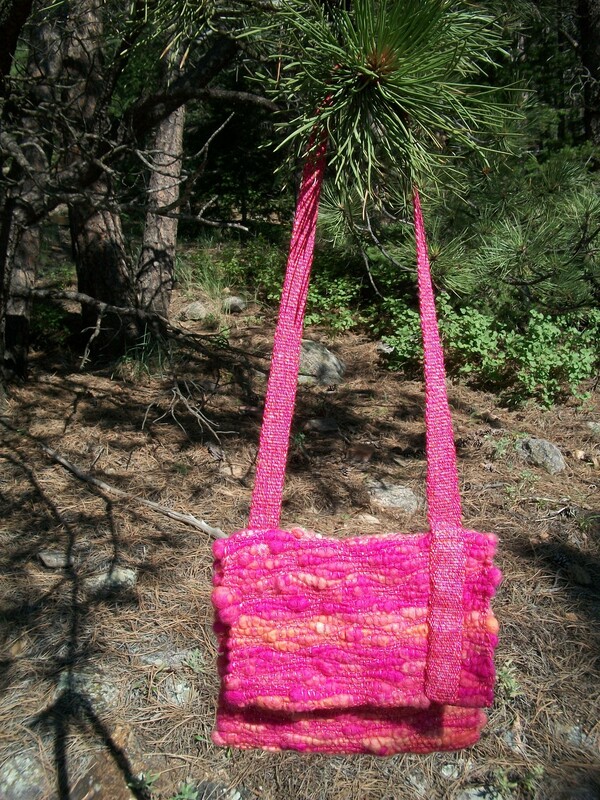 i wove it on my flip loom and the strap was woven on an inkle loom. i love the feel of it and the look of it reminds me of bubble gum! i look forward to using more of their yarn in the future. 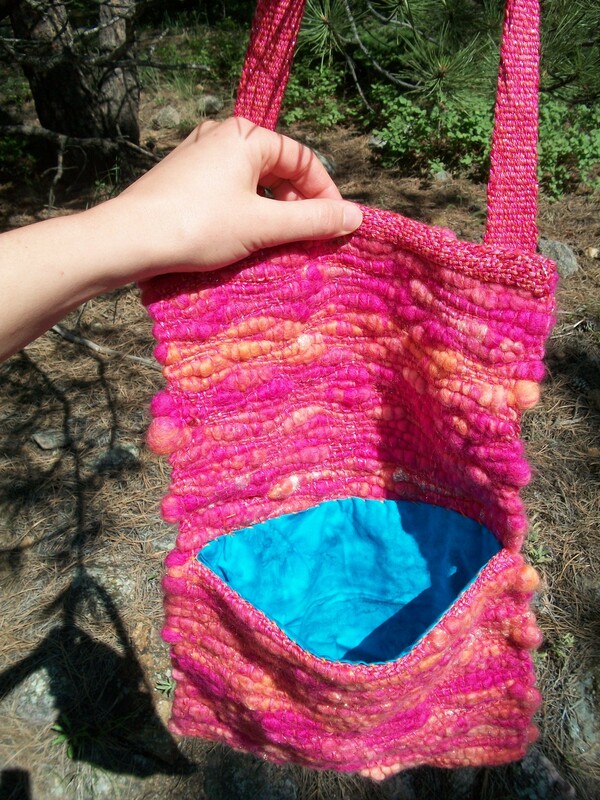 people wonder what you can do with textured yarn, and my answer is…. weave it! one of the projects that took the longest was a random inspiration i had. 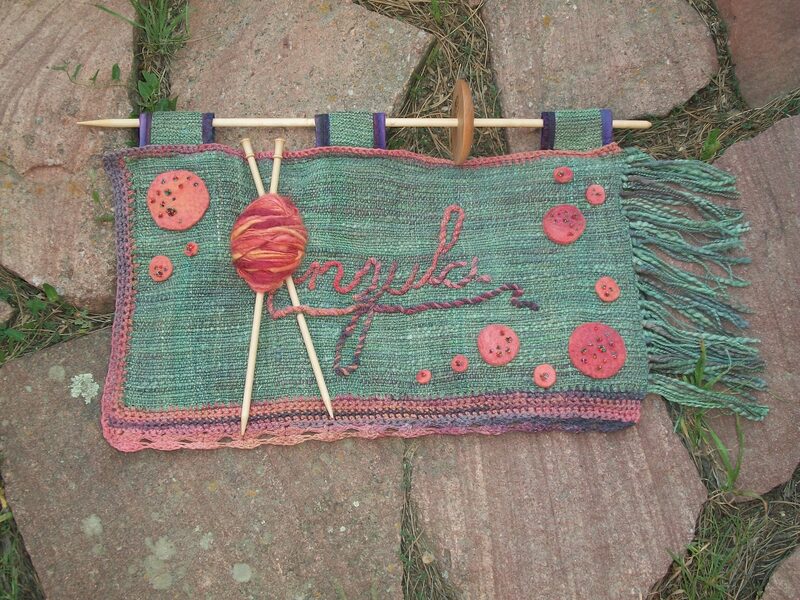 i LOVE Anzula, they have great yarn, but i usually can’t get past the fiber. for me, yarn seems to take half the fun out of a project because that means i can’t spin it myself. 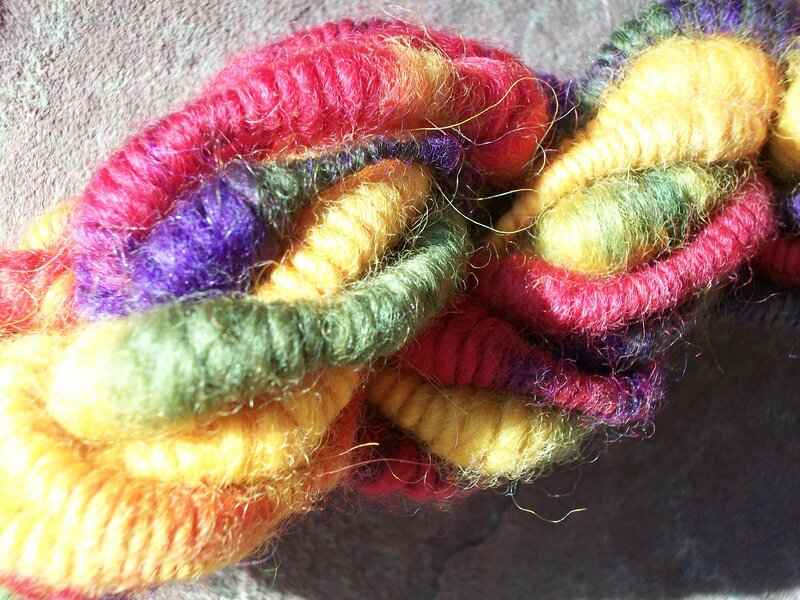 Anzula has everything from hand dyed organic wool, to silk, to baby llama. natural and colored, i love it all! so when i went to their booth to check out the fiber at the end of last TNNA, i ended up going home with quite a few braids. their logo, or at least my rendition of it. i hung the sign from a Schacht navajo spindle. 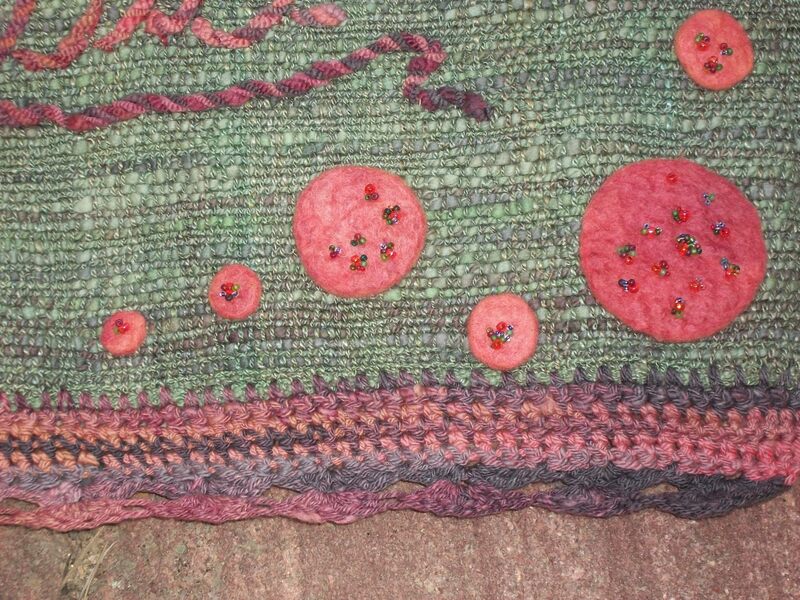 i really enjoyed the felting and the beading, something i don’t do as often. on the back i printed on fabric all of the techniques i used with each specific fiber listed as well. 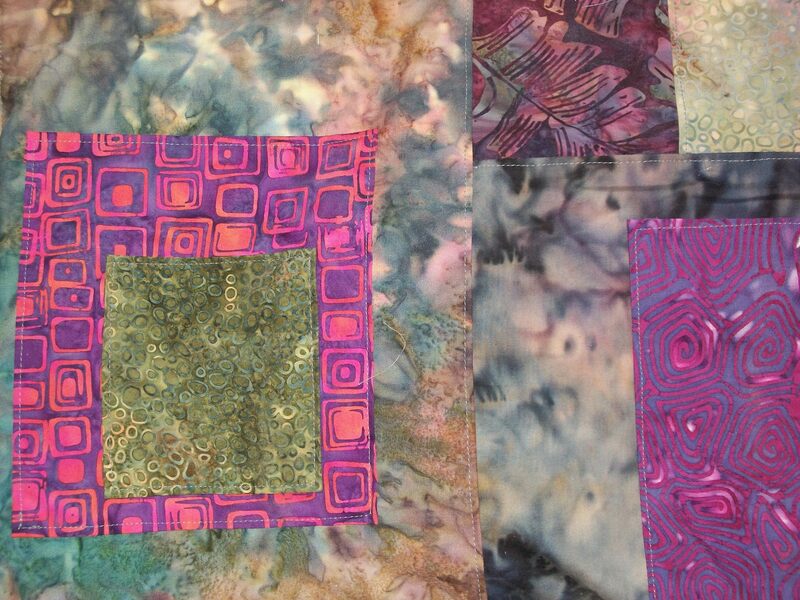 i used batik fabric for the back and quilted it together with batting in between the front and back. Sabrina (the owner) did not know i was doing this, and that is always a little nerve racking. what if i spent all this time on a piece for her and she didn’t like it!? so i was anxious to see her reaction…… she cried she was so happy, and i saw a few tears from her staff too. i was relieved and we were both like school girls on christmas day, even though we were knee deep in booth set up! 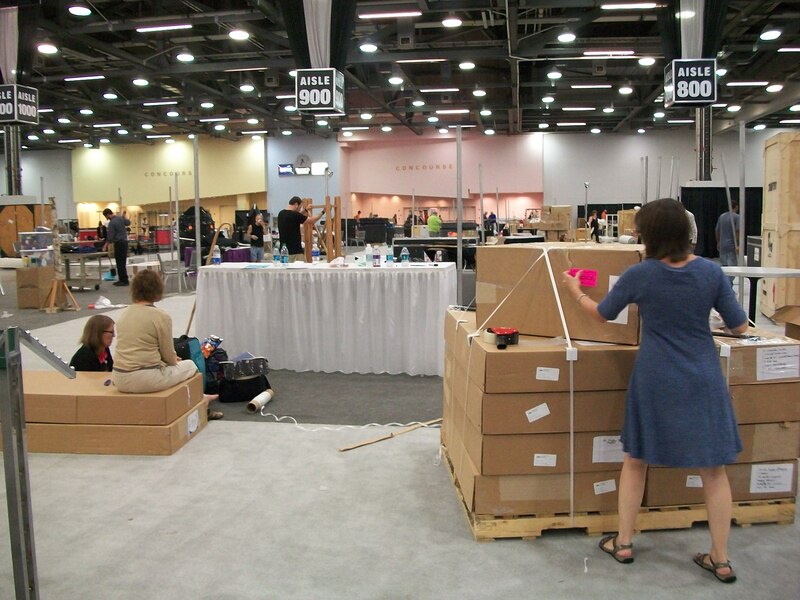 what a packed few months it has been preparing for TNNA (The National Needleworks Association trade show). i will be posting projects that i did for TNNA in posts to come, but here are some pictures of the booth. the Schacht booth is a lot to set up. most people at the trade show are yarn companies. some even fit their booth in 2 suitcases! our palette is about the size of a queen sized bed and almost as tall as me! luckily, we had 5 people to set it up, which still took over 5 hours. it was SO busy we all barely had time to use the bathroom and sneak a bite to eat. what a a successful show for us. yay! 4 days after set up, we tore the whole thing down again with only a couple people to pack it up. this time, we were not the last ones out, but still close. the return palette is always smaller as we sell most of the products in the booth to one of our dealers close by. exhausted, we made our way to one of our favorite local restaurants, the northstar cafe to rest, decompress, and eat. 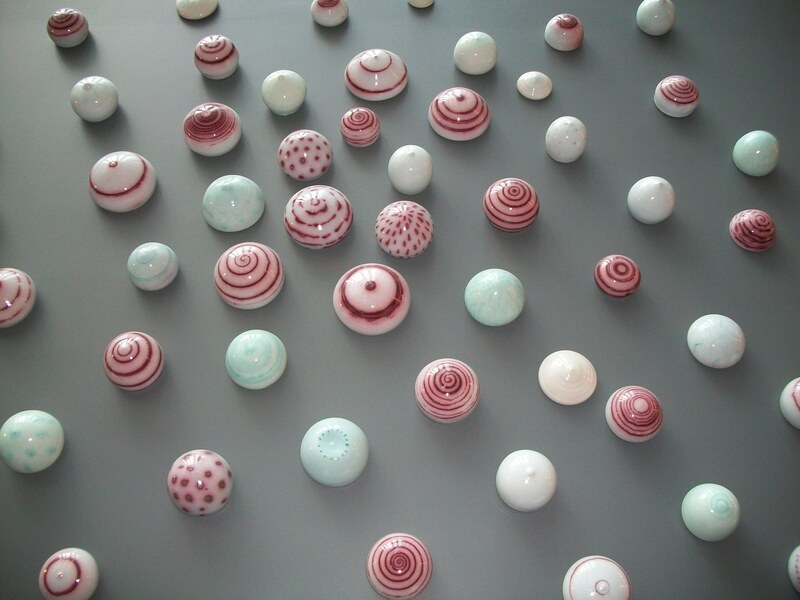 i believe i spent around 200 hours preparing projects for the show aside from my duties at Schacht. i will share those in the following posts. thanks for your patience as i focused on getting them done! 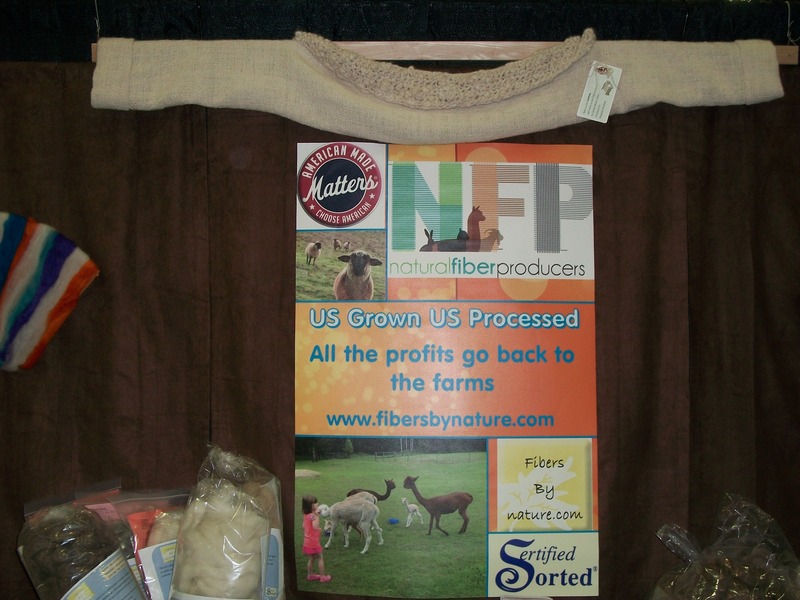 this blog was originally intended for fiber…. the fluffy kind. instead of making a separate blog, i think i will just share my food exploration here too. i have been more or less “paleo” for about 4 years now. i am still finding new recipes and ingredients to add to my recipe repertoire. 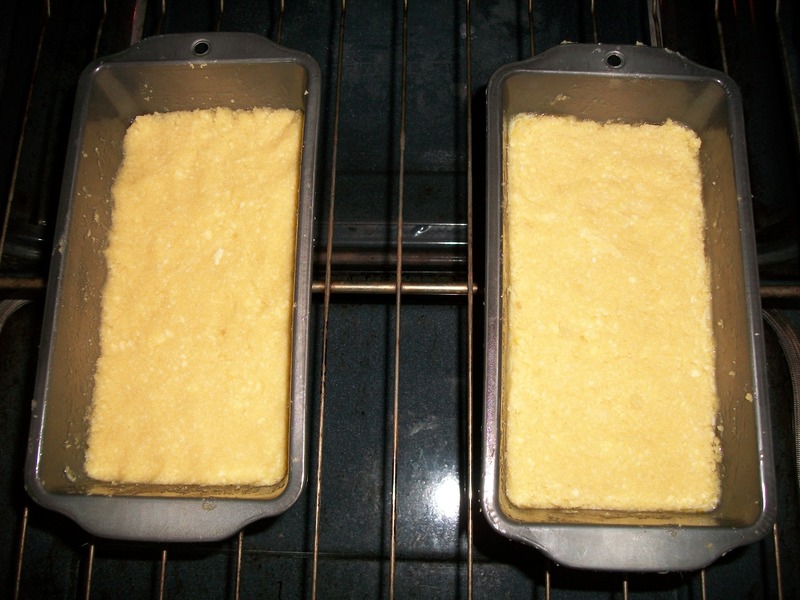 lately, i have been working with coconut flour. 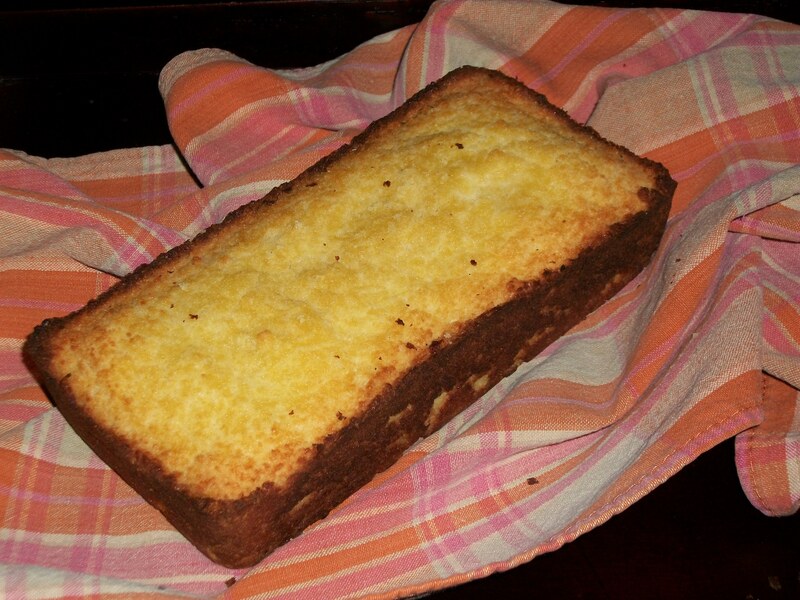 i stumbled upon a bread recipe. bread, woo hoo! this was supposed to be enough for one loaf, but i made two small loafs instead.